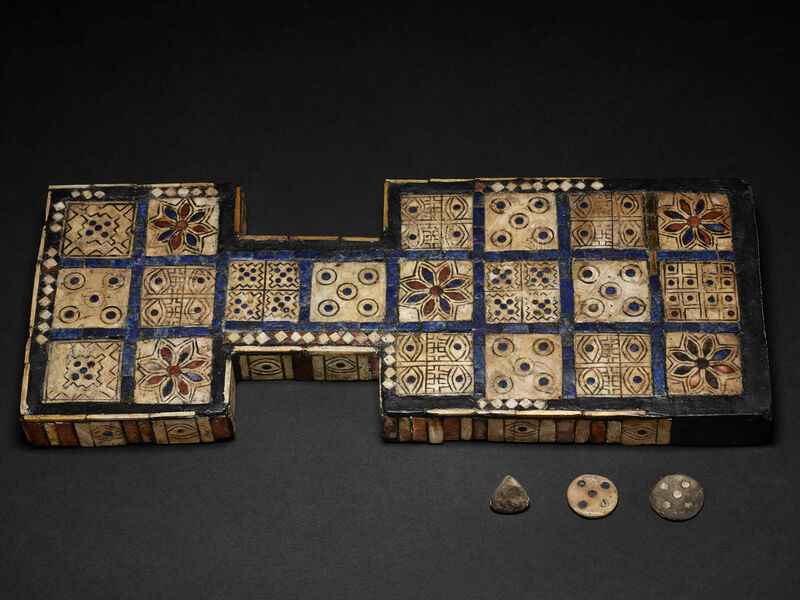 The Royal Game of Ur is a Sumerian version of the ancient Middle Eastern game generically called The Game of Twenty Squares, in Royal Tombs of Ur in Iraq by Sir Leonard Woolley in the 1926-1927, and is dated to roughly to 2500 BCE. One of the copies from Ur is kept in the British Museum. The original rules of the Royal Game of Ur are unknown, but have been reconstructed by a few different historians based on a cuneiform tablet found in 1880 in Iraq, which is now located in the British Museum (Rm-III.6.b – 33333B). The tablet was written in 177-176 BCE by a Babylonian Scribe Itti-Marduk-balatu. 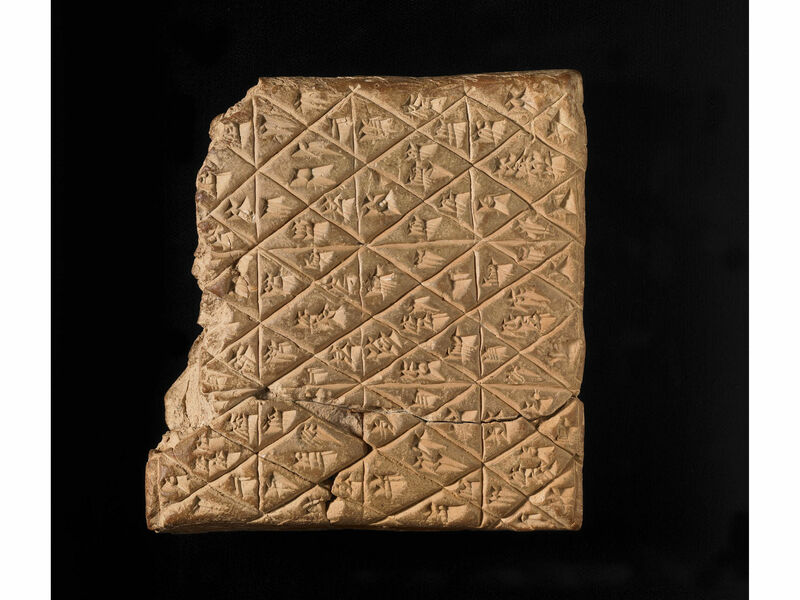 Cuneiform Tablet with rules for The Game of Twenty Squares – British Museum Rm-III.6.b – 33333B. Front and Back Sides. The problem with most rules proposed by historians, such as RC Bell and Irving Finkel is that the game is boring and not challenging. Considering that different versions of this game were found in many Mediterranean and Middle Eastern countries with over 100 examples found archaeologically, we can assume that the game was popular and lots of fun. Historians who reconstructed rules of play lumped the Royal Game of Ur together with Egyptian Aseb, Jiroft Game of 20 Squares, and Shahr-i Sokhta Game of 20 Squares, which used the same board, but did not have any of the square markings, and since the boards are all similar looking and contain 20 squares. However, The Royal Game of Ur board is so much more elaborately designed than Aseb, Jiroft, and Shahr-i Sokhta that it would make more sense that this game is a similar type of game, but the rules are different. Game of 20 Squares. 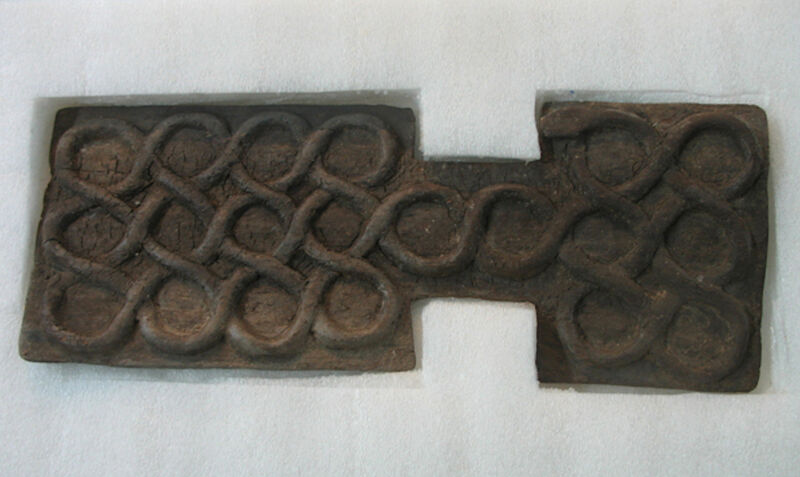 Shahr-i Sokhta, found in the grave IUP 731. Tehran, the National Museum of Iran. I have presented here the most interesting and challenging set of rules which is specific to the Royal Game of Ur and require square markings on each square, as opposed to just blank squares. These rules were developed by a Russian game re-constructor Dmitriy Skiryuk (Дмитрий Скирюк) and originally published on his blog in Russian. The game includes the board, 7 white pieces with dots on one side and the other side blank, 7 black pieces with dots on one side and the other side blank, and 3 tetrahedral dice with two of the peaks of the pyramid marked in a different color than the other two peaks. If one dice has the colored corner up and the other two dice have it down then the score is 1. If two dice have the colored corner up and the third dice has it down then the score is 2. If all three dice have the colored corner up then the score is 3. If none of the three dice have the colored corner up then the score is 4, which is the maximum obtainable score. Additional throws of the dice by a player in a single turn are not allowed. To determine which player starts the game, both players roll the three dice until one of them scores 1. Whoever scores 1 first moves first. All pieces start off the board. Whichever players scores 1 first starts the game either on cell C4 or A4. It does not matter who gets to have white or black pieces. Pieces get introduced onto the board for the first time whenever the player gets a score on the dice between 1 and 4 and the cell into which this piece is supposed to land (C4/A4 for 1, C3/A3 for 2, C2/A2 for 3, C1/A1 for 4) is available. As the game continues the pieces continue to move on the board according to the path shown with blue arrows. The opponent gets black pieces and starts on the opposite vertical end of the board at cell A4, following the same path, but from the other side, as shown with green arrows. Players cannot skip turns as long as making a move is possible. If all of the players pieces are stuck and cannot move then the player skips a turn. Pieces always start on the board with the blank side up and can only move forward along their path. Pieces knock the opponent’s pieces off the board if the piece lands onto a non-safe cell where the opponent’s piece is already present. Blank pieces cannot knock off marked pieces, and marked pieces cannot knock off blank pieces. Pieces can only knock each other off the board if they are turned on the same side. A piece cannot knock off opponent’s stacked pieces, because the only cells where stacking of both sets of pieces is allowed are safe cells. The piece gets flipped over from the blank side to the dotted side when it reaches cell B8, which is exactly the middle of every piece’s path. Once the piece has flipped over to the dotted side it does not flip back to the blank side. If the cell is a safe cell or a cell with eyes (see details further below) then both pieces can reside on it. If the cell is any other type of cell and the opponent’s piece cannot be knocked off then the piece cannot be moved to that cell. If a piece lands on a cell with Rosette it gets a second turn in a row. However, the player is not required to move that exact piece the second time, but rather can move any of his pieces that are already placed on the board, or place a new piece onto the board. A piece that lands onto a cell with Rosette can knock off the opponent’s piece that was already sitting there, and if it does the player that made the move gets a second turn. Pieces that belong to the same player that land on a cell with 4 Eyes can stack on top of each other up to 4 pieces. Note that the pieces stack on the same cell only if they belong to the same player. If the cell is already taken by the opponent’s piece or pieces then the other player’s piece cannot land there. Cell B7, which is the first cell with 4 Eyes in the small block of the board is a switching stacking cell. This means that the player who landed on it first can stack up to 4 of their pieces on it and the opponent cannot knock them off the board or occupy that cell. However, the opponent can cross it to move in to following cells. Once all pieces leave cell B7, then it becomes no one’s and the other opponent can occupy it instead. The reason cell B7 behaves differently than other cells with 4 Eyes is because it is used to enter and exit the smaller block of the board without creating a traffic jam. Cells with Four Sets of Five Dots are safe cells. Any combination of 4 pieces can stack on it. The pieces can be the same player’s or opponents, and can be either dotted or blank. The pieces can move off the cell with Four Sets of Five Dots only in the order that they were stacked, top down. The top piece moves off first, and only once that piece has left the next piece below it can move. As long as a piece has another piece on top of it it is blocked and cannot move off that cell. Cells with a Single Set of 5 Dots are located in the two corners of the smaller block. Once a piece leaves that cell and either lands on or crosses cell B8 it flips over from the blank side to the dotted side. While the piece sits inside a cell with a Single Set of Five Dots it does not flip over. There is only one cell with 12 Dots on the board and that is the last cell on the path – B1. That cell is a safe cell only at the end of the path, meaning that a dotted piece that landed on it cannot be knocked off for any reason. However, a blank piece that is still in the beginning of the path can be knocked off off of it. The cell with 12 Dots can be occupied only by a single piece. All pieces, dotted or blank, same player’s, or opponent’s, are not allowed to stack on top of this cell. Cells with 5 big dots do not have a special function. Pieces can exit off the board from any of the last 4 cells as long as the score on the dice is exact. For example, a piece can exit off the board from cell B4 only if the player gets a dice score of 4, from cell B3 with a dice score of 3, from cell B2 with a dice score of 2, and from cell B1 with a dice score of 1. The goal of the game is to cross the path and remove all 7 pieces off the board by crossing the last cell B1. Pieces that got knocked off do not count and must make it across the whole path again from the beginning. The reason the starting player can only begin with a dice score of 1 is so that they do not get an advantage of potentially moving far ahead of the opponent in the case that they scored 4 on the first try. When a piece lands on a cell with Rosette it gets a second turn. There are some alternative rules where the second turn is only allowed to be made with a different piece, not the one that landed on a Rosette. However, it makes more sense to allow the same piece to move, because if it must stay on the cell with Rosette then it will cause an unnecessary traffic jam. The reason additional turns are only allowed on the cells with Rosette and not on any other cell is because if it they were allowed more frequently it would either cause a traffic jam or the same player would be allowed to take many turns in a row and get an unfair advantage. The reason only 4 pieces are allowed to be stacked on top of each other is because they have to be physically stacked. If more than 4 pieces are stacked they start to fall down. Also, the stacking cells drawings are divided into 4 sections implying a 4 piece stack and not more. The reason the the pieces flip over on cell B8 is in order to prevent a traffic jam when the bridge between the large block and the small block is crossed in both directions. This cell does not interfere with the bidirectional traffic, however it creates a challenge. Strategically, this cell is very important, because the preceding cell is a a safe cell and the following cell is a Rosette. The players can chose to use cell B8 to create a traffic jam on purpose in order to prevent opponent’s movement, although in some case this happens due to players’ error in strategy. The reason the pieces flip over only after passing cell B8 and not inside it is because it makes the game more diverse. For example, lets say that a piece stopped on cell B8 and remains with the blank side up. This causes a tactical trap, so called a “duel” of two pieces that are trying to pass each other. It cannot be knocked off by an oncoming piece, because the oncoming piece is with dotted side up and not with the blank side up. The only way to knock off the opponent’s piece is in the following cell. This causes players to wait for the right dice score to move the piece in cell B8, on purpose, to cause this knock out. In such a case the player has two options. Either to pass the other piece over and land behind it or to stay in front of it and wait for the right dice score to knock off the opponents piece after cell B8 is passed and the piece flips over. Finally, this causes the players to specifically desire a dice score of 1, which is more common with trapezoidal dice, when their piece is sitting on cell B8. If the piece would flip over on cell B8 itself, then players would prefer dice scores of 4, which is less common, or even 5, which does not exist, and sit and wait on cells with Rosette, which would cause a traffic jam for the player’s own pieces, since the opponent’s pieces cannot be knocked off, and the wait for the right score is very long. The reason the last cell with 12 dots is safe, because if it was not it would create an unfair situation where a piece passed the whole path, which took a long time, and then got knocked off in the last second. For this reason in many ancient race games, such as Senet, Aseb, and others, the last cell of the path is always safe. The reason the last cell with 12 dots is not a stacking cell for everyone is because if it was, then it would be difficult for pieces just starting the game to leave the starting four cells rows. This would cause this cell to always be occupied in the beginning and in the end of the game, which would be annoying. The reason the cell with 5 Big Dots does not have any special meaning, is due to the fact that on a second version of the Royal Game of Ur, the only specially marked cells are Rosettes. All remaining fields are marked with 5 Big Dots. Based on this it can be concluded that the more elaborate version of the Royal Game of Ur, which is being used here, simply inherited the design of non-special blank cells labeled with 5 Big Dots, from an older version of the same game, in which those cells had no special meaning. But once the game has evolved new elements and rules have been developed which caused more elaborate cell markings. Finkel, Irving L. “On the rules for the Royal Game of Ur.” In Ancient Board Games in Perspective: Papers from the 1990 British Museum Colloquium, with Additional Contributions. London: British Museum, pp. 16-32. 2007. Actually, if you read Finkel’s academic paper about the broken tablet containing the rules you’d find it wasn’t boring at all. 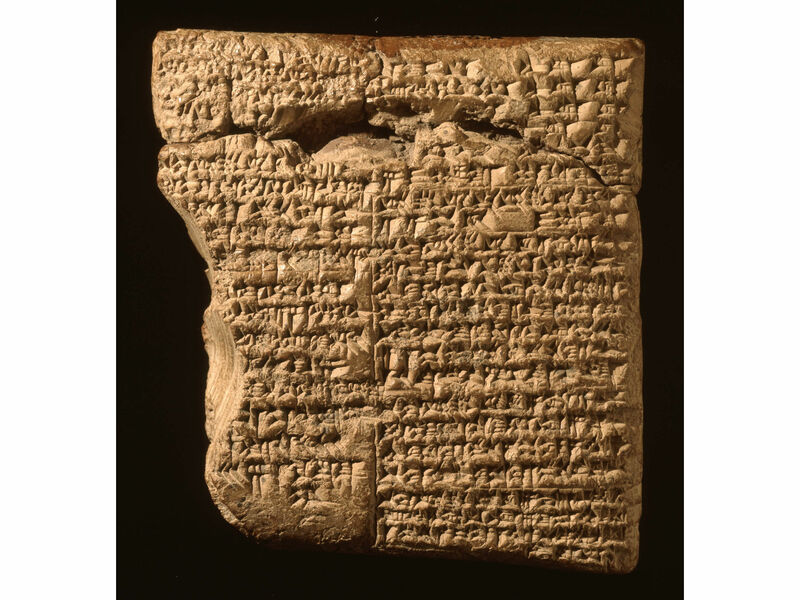 The paper goes into detail on the difficulty involved in translating the broken cuneiform tablet, but it was clear the original rules involved betting. Basically each piece had its own value, and getting each piece into the board required a specific role of the dice (or sticks) to get it on the board. Landing on a rosette square earned you tokens, the number being dependent on the value of the piece. It also may have entitled the player to another roll. Going by the above illustrations, each player entered the board on their side from 4th square to the first. Then they both moved up the middle until reaching the end on the 8th square. Finally they separated again, back toward their respective directions and exited the board after the 7th square. Only the oldest versions have this classic “milk bottle shape”. Later boards had the middle going straight to the end so that each piece was vulnerable until it left the board. Those versions help narrow down the direction of play. 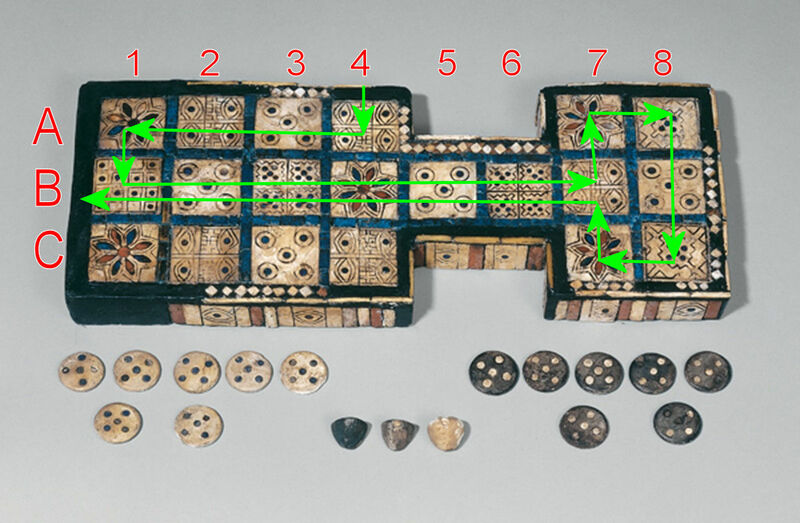 Finkel’s simplified rules are very close to those given to modern Egyptian Senet reconstructions, which isn’t surprising given the similarity in the board structure. I believe they were borrowed in part from another person before the tablet was fully understood. For those interested in something more complex I’d recommend learning the rules by Finkel based on the tablet. Personally I find rules that give each decorated square a special significance a bit convoluted and not supported by the evidence. It’s a quick race game after all – with a bit of gambling, apparently. The ‘eye’ squares are almost certainly decorative only. Eyes are used for decoration a lot in Middle-Eastern cultures. (There are even some decorative eyes around the sides of the board.) We know the big quincunx squares are decorative, and look at how they alternate in a pattern with eye squares. There is no apparent significance to the positioning of the eye squares, and being able to stack pieces (but only on two of the four squares) in your home area makes very little sense gameplay-wise. I do like the path you describe as it links up all the rosette squares by moves of 4, however, this path does make the game quite long. B1 is particularly interesting, being the only unique square on the board. It must have some special significance. The image looks like it could either be a scoring table or an abstract representation of two armies facing off. It could simply be signalling that the central lane is a ‘combat zone’. I agree that B3 and B6 also have a special meaning. They only appear in the central lane, where both colour pieces can be found, and so these squares having some special conditions for interactions between opposing pieces makes sense. I quite like the stacking idea, it has some fun strategy to it, but I’m a little sceptical; do we have any other examples of this type of mechanic in other ancient games? A8 and C8, well, these two squares are what make me think Irving Finkel’s rules are not quite right. Why would these two squares have their own special design if they are normal squares that will only ever be occupied by their respective side’s player? If they are not special squares then why not just repeat the eye pattern like you would expect? I think it’s possible A8 and C8 are safe squares for a single piece. Either they are the square where piece get flipped, and so the safety prevents them from being captured by opponent pieces that have just been flipped also; or perhaps the players have a choice of which way they wish to loop around the small end of the board, this would mean a piece can be taken on the rosettes A7 and C7, and A8 and C8 being safe squares forces the opponent to take the other direction. The rule set presented here is the most interesting one for modern players, at least among the non-betting variants. I’ve been playing Alexei Garbuzenko’s Android app “Forgotten Game of Ur”, which seems to use Skiryuk’s rules. After working my way up to level 5 I think I may have discovered a flaw in the game. Once a player forms a stack of two on B6 consisting of a dotted piece of his own over a blank piece of the opponent, the game is essentially over. The first player can spend the rest of the game merely shuffling his pieces around, waiting for the opponent’s buried piece to be the last, even sacrificing pieces freely, as that is actually an extremely good way to avoid the zug-zwang that might force him to move off of B6. No matter how far ahead the opponent may seem to get, he won’t be able to bear his buried piece till the first player lets him. This strategy is particularly powerful for the first player to occupy B7, since he can then sit there with a dotted piece like a spider waiting for a fly. Because B3 has no adjacent spider’s lair, a strategy based on B3 rather than B6 seems to be less effective. Garbuzenko’s app does not understand this strategy, so this discovery has ruined the app for me. It is possible that with two players who both understand it the game might retain its interest by pushing strategic thinking to a higher level of abstraction but, with so much riding on the first pieces on B6 (and possible B3), I’m skeptical. An alternate solution might be to alter rule 6 so that when a player with pieces on the board has no moves either he wins, or he is able to move a piece that would normally be blocked. Another solution might be to change the rule governing the 4-eyes square B7, perhaps removing its safety, so that the spider would be in danger of capture. On a different tack, I have seen variants of the game where the path starts at A1/C1, goes through A4/C4 and B4, and then continues as in Skiryuk’s version. This has the advantage that a player who gets a bad starting roll of 1 immediately gets a re-roll and it avoids traffic jams caused by dotted and blank pieces colliding on B1-B4, lessening the importance of zug-zwang, which really seems to play too large a roll in Skiryuk’s scheme. In any case my hat is off to Dmitriy Skiryuk for rescuing this fascinating game from obscurity. Great comments. I noticed about B6 too when I played. It’s a good strategy. This looks like a very interesting game. Is there someone offering it for sale? This game uses the two-sided chips, most like representing children or servants, sent to collect the grain dole from the granary for a family unit (B1) 2-parents and 4-grandparents, the home square. Or a Bring Your Tithes to the Storehouse. This is a game for many on multiple levels, 7 chips may represent children or the wealth of employing servants, (note: a healthy fruitfulness for civilization growth, FRR 7.0 was a robust replacement rate), racing from outside the outer wall through the gate to the granary – storehouse. collecting or tithing the societal dole of grain/bread/cheese block. The longevity and play of the game is congruent to the importance and longevity of storehouses and food dole. a global norm for millennia for early cities and nation states. A8 and C8 are safe spaces, the chip leaving the space is flipped, spaces B3 and B7 are safe stack to limit four chips, block when full. Leaving a Rosette, throw six dice to move. Throw 3d2 for normal movement 0=4 & 3 odds 1/8, 1 & 2 odds 3/8.. Throw 6d2 for Rosette movement (0=7 & 6 odds 1/64, 1 & 5 odds 3/32, 2 & 4 odds 1/4 and 3 odds 9/32) Moving the game pieces along. Casting 6 0s is a bonus burst, a 4 is a spot of good luck at the landing on the next Rosetta. Spotting 6 4s for one piece, an P-Ur-feat run. Entering at A4 or C4 and going the full path. Hey Buddy!, I found this information for you: "Royal Game of Ur – Game of 20 Squares". Here is the website link: https://www.ancientgames.org/royal-game-ur-game-20-squares/. Thank you.